Very nice, but why? I’ve heard all the reasons from LADOT staff and others, but I don’t buy it. It’s odd that we can’t use the paint that, say, San Francisco uses on Market Street–seeing that the Market Street lanes see more car traffic, more bike traffic, and more rain than Spring Street ever will. No traction problems there either–none that I’ve seen reported, and none that I experienced myself in multiple bicycle passages along Market (and other green lanes in the area). LA has a history of reinventing the square wheel–we test and test because a process is new to us, but it’s an established and mature technology with supporting literature in other cities, other countries–usually places with far more experience than we have in such matters. I come from an engineering family and have studied science, so I’m not against testing–but I’m also not against using reviews of current best (and common) practices to save time by avoiding needless testing. Suppose it’s either a CYA move or pure administrative timidity. Market street is all asphalt, without the concrete pads of Spring Street. Additionally, since there are center-lane bus boarding islands on market street, there is no wear’n’tear from bus tires on the green lane. Buses cross over the Spring St lanes to reach each stop. Also, SFMTA has had to go back and repaint their lanes a few times already, from weathering. If you type in ‘Evaluation of Thermoplastic Marking Materials’ for a Google search (this ladotbikeblog website does not allow me to post this pdf report directly), the choice at the top of the listings is a report done by the FAA and Federal DOT for airport marking materials. 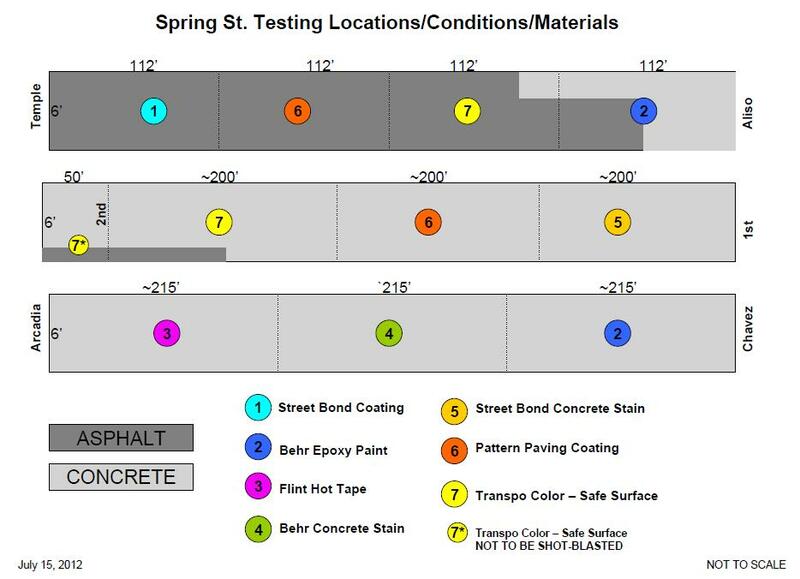 The conclusion on page 28 of the report, or page 38 of the pdf, is that the pull-off strength tests shows that an adhesive is needed for thermoplastic or paint adhesion on Portland Cement. There are also pictures that show longevity comparisons between paint and thermoplastic applications. I had posted information about this pdf report when the previous series of tests by LADOTwere scheduled, but this information seems to have been ignored. Hi Dennis, we’ve done the same research. There are always hyper local conditions at work, and we want to get this right. We also want to compare the costs and sustainability of the various treatments, as well as ease of application. Many of these variables will rely on factors unmeasured or tested by anything in the existing body of research. Somewhat odd post given that yesterday was the first day it rained in weeks! 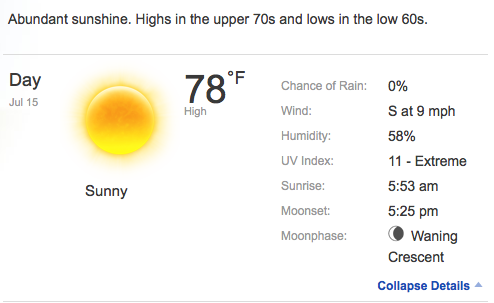 But it looks like the rain should be gone before Sunday. A product that should have been on the test list, instead of the Behr products that are available at Home Depot, is a polymer cement slurry surface treatment called Endurablend made by Tensar. 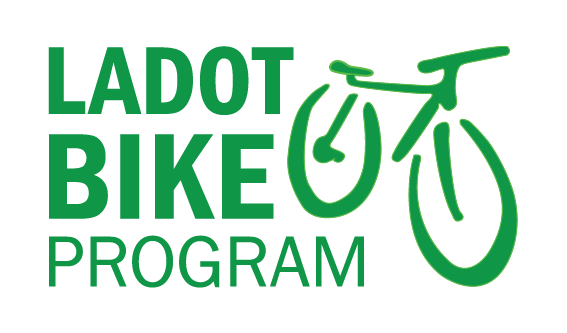 Congratulations LADOT! I know you don’t hear that enough! That’s inaccurate – the lanes have not been repainted at all – though I’d say they do need a touch up soon. Some paint has been in over 2 years now. When will the results of the test be posted?